DJs like Krewella know all too well about these three elements. 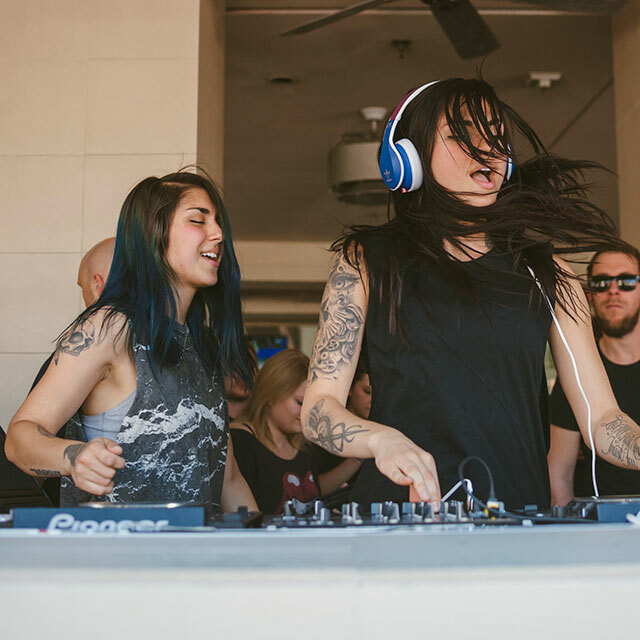 Sisters Jahan and Yasmine Yousaf are two of the Ultra Pool’s newest resident DJs this summer. And with a handful of pool party sets already under their belts, they know what to expect every time they step into the Wet Republic booth. “The pool parties are where we just let loose and play a bunch of really fun, house party stuff,” Yasmine said in an interview with Wet Republic.com. Jahan and Yasmine strive to make their pool party sets eclectic. One minute, you might hear them play the latest big room banger, the next minute, they might drop some old school hip hop. They always find a way to seamlessly keep a pool party crowd on its toes. Considering the differences between playing a day club and nightclub, creating a light vibe is always on top of these two sisters’ minds when spinning at the pool. With the sun shining and the party outdoors, keeping the mood relaxed yet high energy is always a priority for Krewella. In addition to keeping their playlists diverse, Krewella enjoys interacting with their fans at pool party shows. Yasmine and Jahan have a tradition of engaging guests at Wet Republic in a very unique way. Keeping dry is not an option for Wet Republic guests. Seems like the same goes for the ladies of Krewella when they take over the pool, too. Catch Krewella this summer at Wet Republic. Purchase tickets to their upcoming events below!